Some services will have earlier departure times and commuters are advised to check changes. CHANGES TO A number of train timetables kick in from tomorrow. An increased weekday DART frequency, and time changes and altered stopping patterns on other Commuter routes to accommodate the changes. The need to accommodate planned off-peak frequency increases on Maynooth/M3 Parkway, Phoenix Park Tunnel and Northern Commuter lines from December 2018. Additional stops on some services in response to customer demand. Some services have earlier departure times, including at intermediate stations and all changes are weekdays unless stated. Frequency will increase to every ten minutes in both directions (06:50hrs-20:00hrs approximately, Monday to Friday) between Bray and Howth Junction, and then alternating between Howth and Malahide. Greystones frequency remains every 30 minutes. Departure time changes to a number of services throughout the day, including some earlier departure times. Some off-peak weekday services and all weekend services will operate between Dublin Connolly and Maynooth, instead of Dublin Pearse. 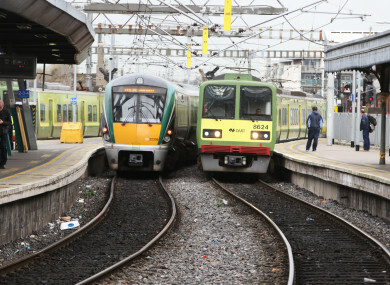 Howth Junction, Clongriffin and Portmarnock will be served by fewer weekday Northern Commuter services, arising from the increased frequency of DART services. Minor departure time changes to a number of services throughout the day, including some earlier departure times. Some minor departure time changes to off-peak services. The 11:00hrs, 13:00hrs, 15:00hrs and 19:15hrs Dublin Connolly to Sligo and 07:05hrs, 09:05hrs, 11:05hrs, 13:05hrs, 15:05hrs and 18:00hrs Sligo to Dublin Connolly will all additionally serve Drumcondra. 11:05hrs Galway to Dublin Heuston (Monday-Saturday) is advanced to 11:00hrs, and will additionally serve Oranmore. 19:35hrs Dublin Heuston to Galway (Monday-Saturday) will additionally serve Oranmore. 07:10hrs Waterford to Heuston is advanced to 07:05hrs and will additionally serve Bagenalstown (Muine Bheag). A number of other services will have revised departure times. Customers on routes with service changes are being advised to check for full details of changes. Email “Changes to Irish Rail timetables kick in tomorrow”. Feedback on “Changes to Irish Rail timetables kick in tomorrow”.